You may wonder why this fruit has to bear such an austere name as "sau rieng" (one's own sorrows). If you are curious enough, travel to the orchard province in southern Viet Nam where the locals are likely to recite the immortal love story. Long ago, there was a young couple that lived in the region. Because of social prejudices that could not be overcome, the couple sought their own deaths in order to be faithful to each other. Their own sorrows received the population's sympathies, and the story of their tragedy has been handed down from generation to generation. To commemorate the couple, the locals have named one of their most valuable fruits sau rieng. Durian is an expensive fruit. One durian fruit is five to six times larger than a mango. Its skin is thick, rough, and covered with sharp thorns. With a gentle cut between the edges of the outer shell, you can easily open the fruit to expose the layers of bright yellow segments of meat that make the pulp look like it is covered with a thin layer of butter. Literature writer Mai Van Tao once wrote about the particularly good smell of the durian. He wrote, "The dense fragrance which spreads near and far, lingers a long time before disappearing. The strong smell can go straight to your nostrils, even though you are still several meters away from the fruit. 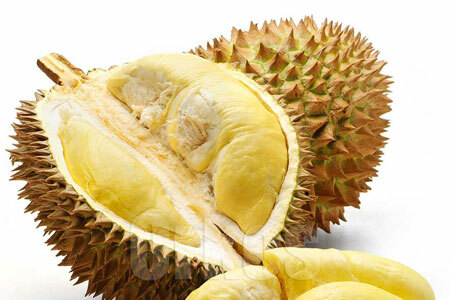 The fragrance of durian is a mixture of smells which come from a ripening jackfruit and that of a shaddock. It can also be compared to the strong smell of foreign-made cheese and is rich as a hen's egg. Others describe the fruit as sweet as well-kept honey. All things considered, durian has a special tempting smell.Those who have not enjoyed the fruit before may find it hard to eat. But once they have tried it, they are likely to seek it again."